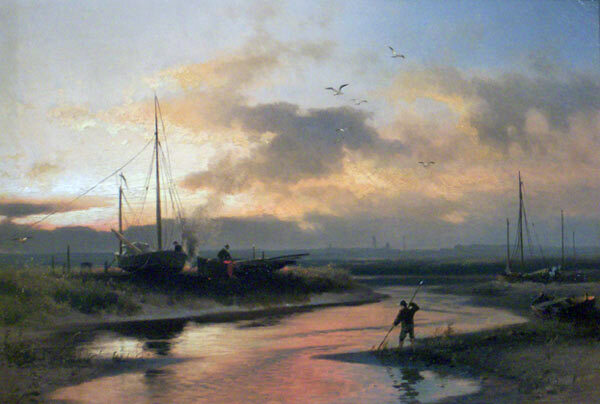 Hermann Herzog was born in Bremen, which, at the time of his birth in November 1831, was a free state. He studied at the Düsseldorf Academy and in Berlin, and he traveled extensively in northern Europe and Scandinavia. Herzog became a popular artist as a young man, attracting such notable patrons as Queen Victoria, Grand Duke Alexander of Russia, and the Countess of Flanders. He emigrated to the United States in 1869, however, when Bremen was about to be annexed into Prussia, and he settled in Philadelphia. As he had traveled extensively in Europe, so did he travel throughout the U.S., at first up the Hudson and around the northeast coast. In 1873 he took his first of several trips west, his primary destination being Yosemite. He also painted extensively in Florida, where his son lived. Working within the style of the Hudson River painters, Herzog seemed to prefer rugged scenes which he may have remembered from his travels in Norway but which were usually associated in the mid-nineteenth century with the work of Salvator Rosa. In many of his paintings, however, there is a strong poetic undertone. This has often been attributed to an early contact with the Barbizon painters, when he visited France as a young man, but which more likely owes to the popularity of the Tonalist aesthetic in America in the last decades of the nineteenth century. Herzog’s investments in the Pennsylvania Railroad eventually made him independent of the sales of his art, and much of his work stayed in his family, suppressing his popularity and reputation among collectors. It was only with the release of much of this work in the 1970s that his reputation soared. Today, Herzog’s work may be found in many U.S. museums, including the Dallas Museum of Art, the Cincinnati Art Museum, the Woodmere Art Museum, the White House, the Metropolitan Museum of Art, and the Smithsonian American Art Museum.